Whether or not that will be the case by May remains to be seen, but certainly this increasingly divergent ethos of each team has been on display already this season. It’s not so much a style of play as much as a method in achieving this style: I couldn’t help but notice the very Tottenham and Arsenal ways that their new number eights have been unearthed and harnessed this season. I’m talking about the more attack-minded holding player, the function midfielder as opposed to the defensive specialist. Both have made a conscious decision to change the individual charged with this role, both have improved their fluidity as a result, but both have achieved this in a different manner. 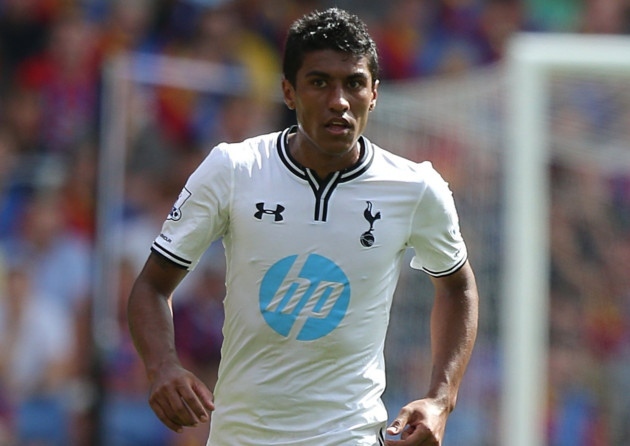 Despite having shrugged off the habit of picking up flavour of the month buys, Paulinho is a typical Spurs acquisition in that he is close to being the finished article, but only proven at a lower level. With a burgeoning reputation and undoubted ability, he has demonstrated his credentials to be considered the best player in the league in his position. However, at the last hurdle Andre Villas Boas and Paulinho have been undone in the most Arsenal of fashions: their new function midfielder, Aaron Ramsey, was already at the club. He has a chequered injury history, a strained relationship with Stoke City and despite Wenger not buying a player for central midfield all summer, his improvement has been – wait for the Wengerism – like a new signing. 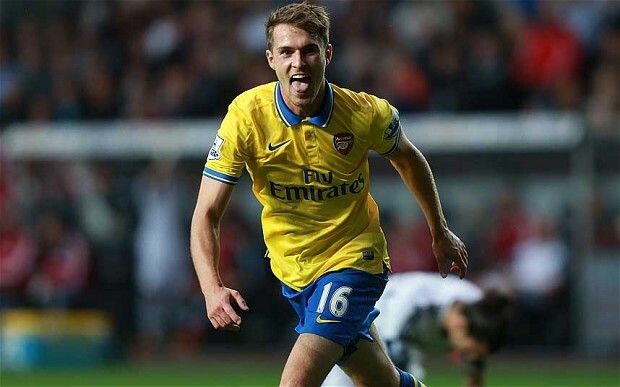 Ramsey has been sensational for Arsenal in leading their charge to the top of the table. He has proven he can pass, an average of 77 times a game at nearly 90% accuracy, complete 33 Premier League tackles, and for the first time in his career, score goals. No doubt these performances from the two individuals have something to do with their topping of the table. In fact geographically, North London is on a combined 28 points, while a unified Red and Blue Manchester second on just 17. Have these two sides spotted upon something the rest of the league has missed, creating an innovative new type of player? Not exactly, because they have joined a trend along with the rest of Europe. But they have been quickest to join the trend, and reap the benefits. If you recall the dreadfully defensive play we were all subjected to at the 2010 World Cup, a key feature of that was what the Germans like to call die doppelsechs: a holding duo. If we haven’t quite left the 4-2-3-1 behind, it can certainly be remarked that this World Cup was its heyday and perhaps even its nadir during the final as Van Bommel and De Jong failed to bully Spain out of the game. The key feature of the popular system in South Africa was a highly defensive duo in the holding roles, creating a split team between an attacking four and defensive six. Ask yourself which top international and club sides perform this tactic now, and the answer is not many. In the last three years a central midfield trio has remained the popular choice for most clubs, but generally with one defensive midfielder and one creative player. The third man, increasingly, is a link up man, an energy player or a box-to-box type. A nostalgic throwback to a more Roy of the Rovers era, the number eight is making a comeback: in a slightly deeper role here and a more attacking position there, the function midfielder has been liberated, and the teams who have got the best out of this have reaped the benefits. This is why we should all love number eights in the modern setup; they may not be the most attacking player on the pitch, but they are the most attacking defensive player. Last year’s Champions League final was dominated in the build up by talk of the turncoat playmaker Mario Goetze, but the Dortmund player who shone in the match itself was İlkay Gündoğan. The quick transitions from pressing to attacking are often underpinned by his intelligence in knowing when to hold, when to push up, how to best use the ball when time is crucial and how to keep it when possession was required. Before him the all-rounder Nuri Sahin was Bundesliga Player of the Year. Neither are what you would call box-to-box players, but their adaptability and intelligence give them the illusion of being everywhere. Arturo Vidal has been excellent for Juventus over the past two seasons, changing his game from a holding destroyer to becoming a competent passer who can drive forwards and shoot. This all action sort of player’s threat going forwards can be as essential to their defensive work, as Chelsea found out last season: Oscar did a superb job on Pirlo, but this allowed Vidal to roam out of his deep starting position to become, effectively, their most advanced midfielder. Deep-lying playmaker Bastian Schweinsteiger thrived off Javi Martinez’s running game last season. Jordan Henderson is slowly carving a niche for himself at Liverpool by adding energy to a more ponderous midfield. The list extends to so many top clubs now. The question as far as the Premier League is concerned remains why Arsenal and Tottenham have been quicker to adapt their formations and whether the other sides can mimic the excellent acts of Ramsey and Paulinho. While Manchester City appear to be sticking with a two midfielder system, so in effect they are the anomaly in this debate, the key for Chelsea and Manchester United appears to be fluidity. Chelsea have several players who could in Frank Lampard, Ramires and until his recent and cruel injury, Marco van Ginkel who could play the role but none seem to be trusted to perform this task regularly. Chelsea though have got around this problem in recent seasons through achieving lateral fluidity; a clever exchange between Eden Hazard, Oscar and Juan Mata was essential given that they lacked players deeper in midfield to rotate with. Chelsea this season appear more rigid with the addition of Andre Schurle, because he is more direct, but they do not appear in need of a number eight as much as Manchester United. The derby humiliation is certainly not the first time Manchester United have appeared too rigid, but it does encapsulate their tactical problem. Tottenham and Arsenal have stuttered through one or two games each this season whilst managing to win, whereas Manchester United have been too predictable to manage this when their creative players were misfiring. The reinstatement of Wayne Rooney is not the answer to this, and though it will help with their creativity, a promotion to the starting lineup for Shinji Kagawa is unlikely to be a magical cure all either. The problem remains even after this that Manchester United are a split team, a 2010 team, and if Michael Carrick and Marouane Fellaini are unable to find an understanding about variance of position, they will remain two halves of an 11 with no pieces of eight. Though both, and indeed Tom Cleverley, exhibit many of the traits of other midfielders discussed here, the key difference is they all lack the talent of arriving at the right time in the attack. This is the real explanation for where Ramsey and Paulinho’s glut of goals have come from. Ramsey in particular could be exasperating to watch in the past, and was berated for wasting so many edge of the box chances in the 2011-12 season, in which he was effectively asked to replace Fabregas. While many pointed to this as a poor season for Aaron and evidence of his inability to play at the top level, it was quite the opposite in terms of demonstrating his reading of the game like a true eight. Ramsey was wasting chances through lack of composure in an unfamiliar advanced role, the pressure of replacing the former captain, and poor shooting technique. He was, however, arriving at the right time in the box. This knack for getting to the box at the perfect moment is harder than it sounds; a subtle mixture of timing a run, reading the play, anticipating the ball, understanding your teammates and conning your marker. Ramsey has it, and if you review old matches, he always had it. What he has never truly had was that lockpicking ability of a real playmaker, which is why his one season as number ten went so badly. He couldn’t arrive in the advanced position, he was already there. Paulinho is similar in this respect, and it will be interesting to see how the relationship between him and Christian Eriksen evolves in comparison to Ozil and Ramsey. While these playmakers have been the main attacking threats for both sides so far in 2013-14, the movement from deep of the number eights has got the most out of them, and broke out of the rigidity that the 4-2-3-1 often suffers from. This entry was posted in Tactics and tagged arsenal, carrick, football tactics, gündoğan, oscar, paulinho, ramsey, scholes, tottenham, vidal by Simon Smith. Bookmark the permalink.